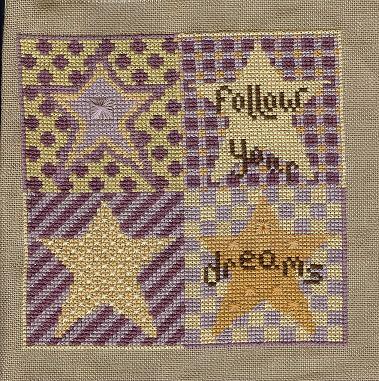 This is block #4 for me for the redwork quilt. I decided to start on MBT Morning prayer. I'm doing it over 2 on 40 ct. with SNC Acorn Woods. It will still be @ 11 x 20 when done on 40 ct. I didn't get much stitching done over the weekend because we were out doing family things. 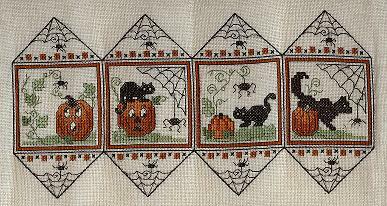 On Friday I finished (minus the beads which go on after interfacing) Sweetheart Tree's Halloween Quadraille. This will be fairly easy to assemble. You use the same method as doing a biscornu to close it up. I also picked up block #3 of my redwork snowmen blocks and finished it up. I'm on such a roll now on these that block #4 is 1/2 way done too. (I do 1 large then 1 small on these to keep me going). Crabapple Hill This is the quilt my mom will make it into when I finish the embroidery. 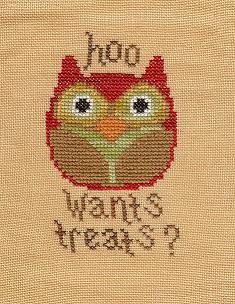 This is a cute freebie from Cherrywood studio designs. I subtituted with GAST & Weeks that I had on hand. It's on a scrap of Pumpkin colored linen that I also had on hand. This was a fun piece. 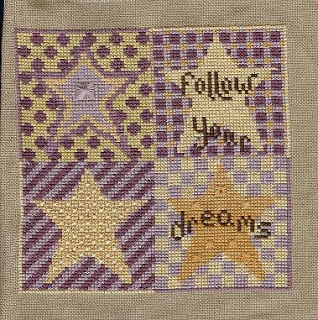 Twisted Threads Itty Bitty Dreams using DMC. I did it over two so it's not so itty bitty, turned out 5 x 5. I will probably make this into a flat hanging piece for DD to possibly put in her locker at school. I've been working back and forth on 2 pieces. I finally got one of them finished. This is a leaflet Joy sent to me - 4 My Boys-Fear not tomorrow. I did it over 2 on a piece of sewing linen...it's not square count but I like how it turned out. Some pieces it doesn't matter if the squares are even. 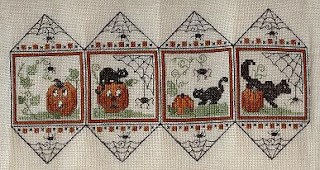 I'm even thinking of doing a reproduction sampler on some similar to this....they most likely didn't have even/cross stitch linen back then. I still have to add the buttons to the middle section(have to purchase them yet). Milly, the leaflet is on it's way to you.